Dirt and camping pretty much go together. When I go camping, I always have bunches of disposable wipes handy along with a couple of extra dishpans, but I'm always on the lookout for something that creates less garbage and is more convenient. 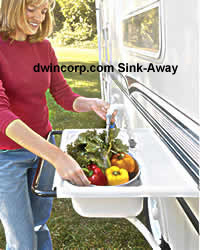 The Sink-Away from DWIncorp.com seems like just the thing I've been looking for. They've come up with an RV sink designed for the one place it's needed most - outside. According to information from their website:"Self-contained, portable Sink-Away mounts almost anywhere on RV exteriors....It's ideal for washing hands, paws, faced and fresh food - even for cleaning fish." It sounds like a good idea to me. The only thing I don't like about it is that it looks like installing the frame the sink attaches to requires drilling screws into the side of the RV.